Steve Yockey’s afterlife: a ghost story should be subtitled an evening of one acts. While both acts of the play contain the same characters and themes, the familiarity ends there. Act I displays a realistic, yet mundane evening between a grieving couple; they are packing up the beach house where they used to live. They talk around the subject of their son’s death, but other than some yelling and “crying” they really remain stuck in one place until their house is washed away. Act II portrays a fantasy world (somewhere between heaven and hell) where the Danielle, Connor, and their son work out their grief. They receive the assistance of a postman, a proprietress, another ghost, and a bird puppet. afterlife: a ghost story has potential to transform into an interesting play if the first act removes ninety percent of its action and the second act has the chance to develop more fully. Regrettably, the problems do not stop with the script. The two main actors, Marianna Bassham and Thomas Piper, never connect to their characters’ emotions. Ms. Bassham’s Danielle remains stoic, which does not translate to the stage. There may be internal struggle, but the audience only sees some anger at the end; the rest is mechanical. Ms. Bassham’s character Danielle often says she is crying, but Ms. Bassham never approaches anything that even looks like crying. Danielle throws things across the room; nevertheless, the action seems unwarranted and unmotivated. As I said before, the first act is awkward and perhaps if only a few lines of her monologue were left in and then she went to the fantasy world, maybe her performance would have been more genuine. Thomas Piper plays the relatively normal Connor. Piper’s performance consists of only two levels: calm or angry. His portrayal brings no depth to his character until the end of the play, which makes me believe that he might have had more emotional development if he had been in the fantasy world longer. Hope arrives in the second act with the supporting cast of Karl Baker Olson, Dale Place, Adrianne Krstansky, and Georgia Lyman. Each one of these actors brings unique characterizations that enliven the lethargic atmosphere. In his second role that I’ve seen (1st Vengeance is the Lord’s), Karl Baker Olson still brings a fresh, honest air to his work. Possibly as a result of his age, he does not “try to act” but keeps himself fully present in each moment. My disappointment is that his character does not play a bigger role in the production—particularly since he is the focus of the emotional upheaval. Dale Place is a charming as both the postman and the bird. 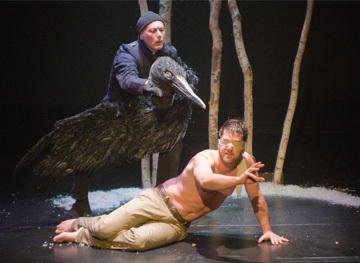 The puppet bird provides an interesting visual aspect but does not add much to the story; it looks more like a gimmick than a vital part of the production. It should either be integrated more into the script or taken out. Adrianne Krstansky plays the composed Proprietress that tries to change Danielle’s point of view. Her sharp remarks and witty gestures bring levity to a rather tense scene. Georgia Lyman is the creepy shell of a person; her humming, laughs, and ticks leave no doubt of her ghostly nature. Both characters draw Danielle out of herself and perhaps if she had spent more time with them, Ms. Bassham would have had more emotionality to work with. The lighting and sound are crisp and even made me jump a couple of times during the storm. However, the script itself needs to be reworked before it is truly ready for production. Since this is a “rolling premiere” of the National New Play Network, I suggest waiting until it goes to another city and (hopefully) changes before you see it. 1/17/11. TNETG. This entry was posted in Drama and tagged 2011, Adrianne Krystansky, Boston, Dale Place, February, Georgia Lyman, grief, January, Karl Baker Olson, new play development, New Repertory Theatre, puppet, Steve Yockey by beccackidwell. Bookmark the permalink.